Like most things wrapped in dough, this is a friendly, go-to choice. The variations on dumpling fillings and shape are endless, and it is surprising how easy these are to make at home. Start with a large batch, freeze it, and you'll always have a quick snack, appetizer, or meal ready in about 8 minutes. I once made the filling from ground meat I found in the freezer; I defrosted it, then mixed it with some lone scallions and ginger found in the back of the crisper. "You know that's turkey, right?" my husband asked. I had thought it was pork. So I just boosted the seasoning a little to make up for the fat flavor lacking in turkey. I made enough to eat right away and also to freeze for later. In a small bowl, combine all the ingredients for the dipping sauce. Set aside. In a medium bowl, mix together the meat, bok choy, ginger, garlic, soy sauce, sesame oil, and salt. Stir in the egg white. To cook the dumplings, heat a large skillet and swirl some oil around to coat the pan. Add a single layer of potstickers. Cook for 2 to 3 minutes (2 minutes longer if frozen), until they begin to turn golden on the underside. Don't move them. Add ¼ cup of water to the pan and cover immediately. Cook for 5 more minutes, or until the meat is cooked through and the dumplings release from the pan. Serve immediately with the dipping sauce. 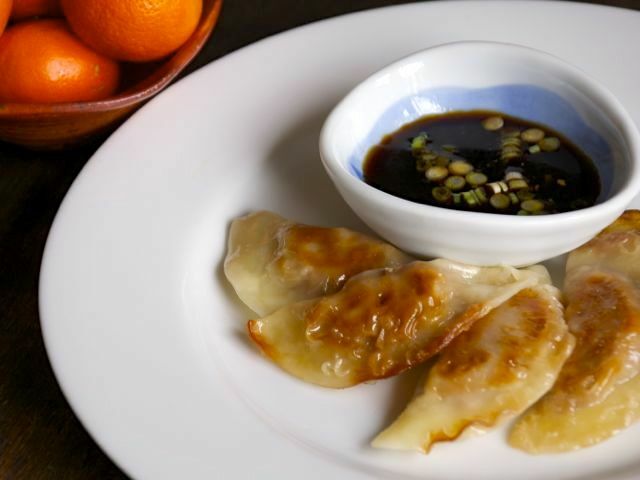 Dumpling wrappers — Chinese wonton or Japanese gyoza skins are the same thing — are widely available in the produce or frozen-food section of most markets.